The latest Mattie Winston Book! Stiff Competition by Annelise Ryan is the seventh book in the Mattie Winston Mysteries. Stiff Competition picks up eight weeks after the last book in the series. Mattie Winston has had her baby (named Matthew Hurley) and it is her first day back at work. She is called out to a crime scene in the woods. Lars Sanderson, the real estate developer, is the victim. There are many suspects because many people were not happy with Lars business practices (he was building strip malls and cheap condos) and his womanizing ways. Mattie will be busy trying to solve the case and adapt to being a single mother. Mattie and her boyfriend (and baby daddy) Steve Hurley have not been able to move into together because of Emily! Emily is the daughter Steve did not know he had until recently. Emily is fifteen and a handful. She resents Mattie and is making life as difficult as possible for Steve and Mattie. Then Emily disappears. Matt wonders if Emily went back to Milwaukee where she used to live with her mother. Mattie searches Sorenson (Wisconsin) for Emily. Mattie has a feeling that there is more to Emily’s disappearance than an upset teenage girl. Will they be able to find Emily in time? I enjoyed Stiff Competition much more than the previous book in the series (which I only gave 3 out of 5 stars). I thought I would give the series another chance, and I am glad that I did. The book starts out a little slow (with a lot of whining), but it gets much better. The murder mystery (as well as Emily’s disappearance) are easy to solve, but there are some good clues to follow. I did feel that Emily’s disappearance dominated the book. The murder of Lars Sanderson took a back seat in the novel. I really feel bad for Steve Hurley. Hurley, once again, played a small role. I hope he plays a bigger part in the next book (and that Mattie is less hormonal). 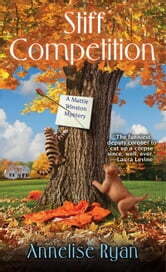 Overall, Stiff Competition was a good cozy mystery. I give Stiff Competition 4 out of 5 stars. I received a complimentary copy of Stiff Competition from NetGalley in exchange for an honest review.